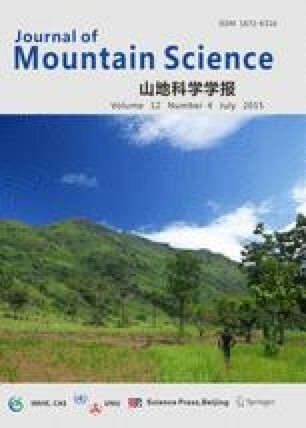 A detailed landslide susceptibility map was produced in the Youfang catchment using logistic regression method with datasets developed for a geographic information system (GIS). Known as one of the most landslide-prone areas in China, the Youfang catchment of Longnan mountain region, which lies in the transitional area among Qinghai-Tibet Plateau, loess Plateau and Sichuan Basin, was selected as a representative case to evaluate the frequency and distribution of landslides. Statistical relationships for landslide susceptibility assessment were developed using landslide and landslide causative factor databases. Logistic regression (LR) was used to create the landslide susceptibility maps based on a series of available data sources: landslide inventory; distance to drainage systems, faults and roads; slope angle and aspect; topographic elevation and topographical wetness index, and land use. The quality of the landslide susceptibility map produced in this paper was validated and the result can be used for designing protective and mitigation measures against landslide hazards. The landslide susceptibility map is expected to provide a fundamental tool for landslide hazards assessment and risk management in the Youfang catchment.